With the gentle knock of wedding season on the doors, salwar-suits have started to return back and make a place in the latest trend! The basic styles of salwar suits have undergone a huge makeover process over the period of time and have turned up beautifully in all new refreshed, renewed and refurbished forms! 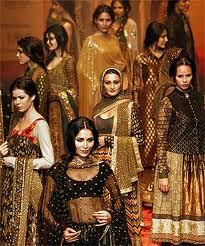 A tinge of newness can be very evidently seen in the style of salwars hitting the markets these days. Transformed and improved version of salwars has come up in the form of new dhoti style. So, now it is high time to show your regular, boring and outdated salwars the way out of your wardrobe, and embrace new dhoti style suits. Pakistani salwar suits behold breath taking charm and are designed to slip well into all different occasions. Those long length kurtas prepared with high slits and meticulously combined with straight or pallazo pants are turning out to be a great hit among youth. These are creating a huge demand and gradually breaking the vicious monotony of wearing regular salwar suits. High slits in Pakistani suits in fact make you look taller than usual! Sizzling hot trend is of long anarkalis or lehenga salwar suits that give very much expression of Indian ethnic lehengas and have started to turn up into next big thing. With either a jacket top or long slit overlapping layer, you can make your suit look more like a lehenga. Nobody can stay away from the magic of chudidar salwar suits! Long kurtas with fitted chudidar never go out of fashion. Easy to wear and comfortable to be in, chudidar suits are suitable for every occasion.